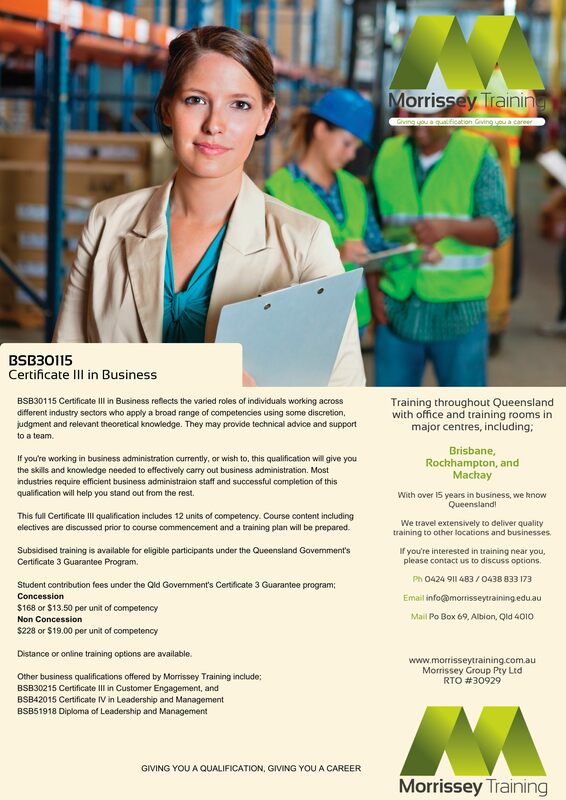 Morrissey Training is now offering BSB30115 Certificate III in Business under the Queensland Government’s Certificate 3 Guarantee Program. If you’re working in business administration currently, or wish to, this qualification will give you the skills and knowledge needed to effectively carry out business administration work. Most industries require efficient business admin staff and successful completion of BSB30115 Certificate III in Business will help you stand out from the rest. This full certificate includes 12 units of competency. Course content and electives are discussed prior to course commencement and a training plan will be prepared. Subsidised training is available for eligible participants under the Certificate 3 Guarantee Program, funded by the Queensland Government. $168 or $13.50 per unit of competency. $228 or $19 per unit of competency.